Two going on twenty. : I Heart Gadgets! Along with my dream camera I have added this nifty little doodad to my wish list. 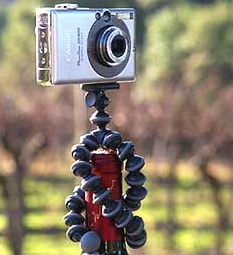 Gorillapod, a small, flexible tripod tool that can attach itself to just about anything. What a great idea! I saw Jon this evening in Amsterdam. Couldn't find your e-mail, so I'll try it this way. Filmed this with my cellphone. Sound is not that good, but it is something.